If you are taking two different levels of the exam on the same day, the fee will be 10,000 JPY. We are unable to refund any test fees that we have received. 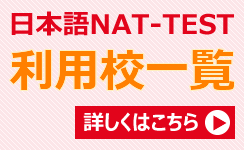 Registration for the NAT-TEST is done via e-mail. Please send us an e-mail with the following information included. After we have received your application, we will let you know how to make a payment. In order to ensure the speedy and accurate handing of your application, make sure the subject of your application e-mail is: "NAT-TEST REGISTRATION"
*Please attach a clear, passport-style photo of your face to the e-mail as well（A photo taken within 3 months from the date of application）. You may register all the students taking the exam at your school together. The registration method is the same as an individual application. Please apply via e-mail. We are unable to refund any test fees that we have received. If you wish to do so, please contact us. If you wish to make a cancellation and you have not yet paid the test fee, please email us. 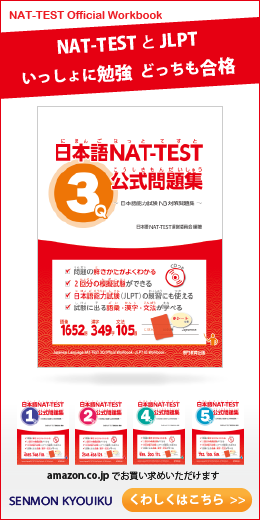 After you have applied for the exam, for an explanation of the rest of the NAT-TEST process, including what will happen on exam day and how and when you will receive your results, please see this page. Test registration may close early if maximum seating capacity is reached. In that case, we will add your name to the waitlist. Once a seat opens up, we will inform you if you are next on the list. Maximum seating capacity of each level depends on the number of applicants. Moreover, applicant who applied for two different levels might take only one level due to the number of applicants.